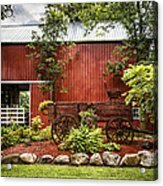 Very gorgeous setting, Congratulations on your sale! Beautiful capture Debra and Dave! Congratulations on your sale! 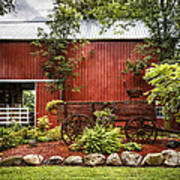 "The Old Wood Cart" by Debra and Dave Vanderlaan ... A beautiful old red barn in the middle of rural Michigan has a unique antique wooden cart on display in the garden. 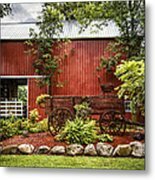 The farm is a dairy farm on the country back roads of lower Michigan. The midwest is known for family farms run by enterprising and hard-working families. The eye-catching barn is full of hay for the livestock and sits at the edge of the big pasture where the dairy cows are grazing. 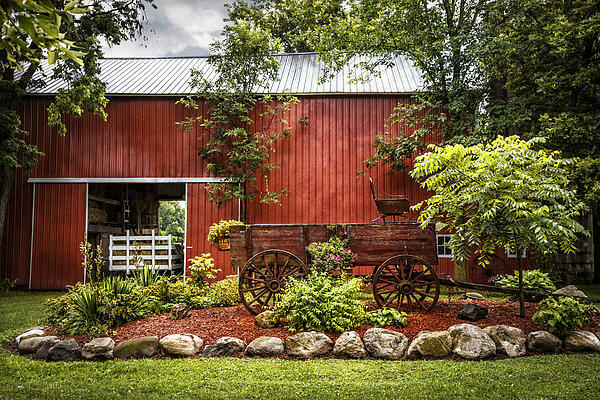 The morning light is soft, illuminating the red sides of the barn and the pale blue tin roof on the tall 2-story structure. Enjoy America's farming at it's best!